Snap Inc. (SNAP) has been getting plenty of headlines for going public late last week. Consumer technology companies tend to get a lot of publicity and Snapchat has an estimated 150 million-plus daily users so it makes sense this one has been getting so much attention. The IPO offering price was set at $17/share but the stock immediately opened up at around $24/share. It got as high as $29.44 on the first full day of trading but has since fallen back to just over $21/share, meaning it’s already down almost 30% from its highs in just a few short trading days. It’s way too early to tell if Snap will be a successful investment or public company. I’ve never even used the product so this one definitely falls into my too hard pile. There have been a number of huge flameouts in this group and only two real winners — Facebook and Alibaba. But these numbers simply show the gains or losses from the offering price. Very few investors actually ever see that offering price because the float is typically so low on these shares and the demand is so high that there’s almost always a huge pop on the first day of trading. Many of the losses look ever worse once you factor in that first day. The majority of the gain in Alibaba is completely wiped out. Twitter shot up all the way to around $70/share within the first few months of trading, so some investors could be sitting on close to 80% losses there too. Facebook remains the only company that’s been able to shine. 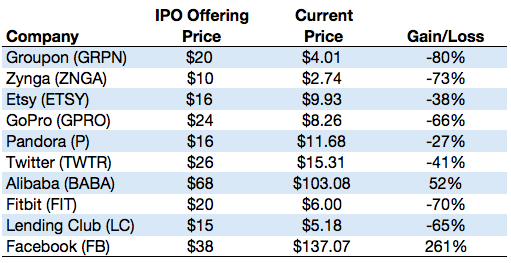 The fact that these IPOs have all come during a strong equity bull market is another black eye for the performance of these shares. Lots of people have been saying we’re in a technology bubble for a number of years now. While this IPO performance certainly doesn’t look like a bubble, if there was a bubble, the bursting of it has been outsourced from the private owners of these companies to the public owners. Obviously, this is a tough space to pick the winners and losers. Competition and innovation make it very difficult to know whether or not a company will continue to dominate like Facebook or be a flash in the pan like Groupon or GoPro. History shows that the majority of IPOs end up underperforming the overall markets. A number of other big-name tech companies, including Uber, Spotify, and Airbnb, could be filing to go public in the coming years. If they do, it will be interesting to see if this trend continues. It seems that private investors are enjoying all of the spoils in these deals while most public stock market investors are left holding the bag.